When Notre Dame senior Dan Jacobs signed up for an elective while studying in London last year, he wasn’t expecting that his course selection—seemingly unrelated to his industrial design major—would spark the idea for his B.F.A. thesis project, or potentially help thousands of children. Called the “Riverside Program,” the course involved working with children with developmental disabilities. The challenge Jacobs anticipated became more acute as he was struck by the reality that most of the toys the children played with were repurposed toys designed for mainstream students that didn’t cater to the needs of those with disabilities. Called “Hands On,” the toy Jacobs created resembles a pair of ordinary gloves. 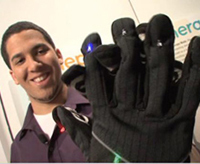 These gloves can be used in several modes, each producing an electronic effect when activated in certain ways. “Hands On” only functions when played with in cooperation with another person. The creative mode allows two children to each wear one of the gloves and try to produce sounds or activate lights when they align them in certain ways with each other. The game-play mode is prompt-based and requires the children to work together following common prompts, like bringing corresponding fingers together or moving them in a particular way. The therapy mode allows the unit to be manually controlled by the parent or therapist using a computing device to cater to the specific needs or areas of interest to the child. Integrating several fields—design, psychology, electrical engineering, video, graphic design, and computer programming, developing “Hands On” was especially gratifying for Jacobs. Jacobs hopes to eventually patent “Hands On” and bring the product to market. In the meantime, he’s weighing options for his immediate future—which include graduate school, pursuing the project through Notre Dame’s Innovation Park, or possibly a career in the consulting side of product design.